Greeting friends! The Baltimore Art + Justice Project website www.artplusjustice.org launched June 2013. Almost one year later, we have close to 200 profiles of Baltimore artists, designers and organizations. We anticipate a flurry of new entries as we increase our outreach over the next year, especially in the Station North Arts and Entertainment District. To give you a sense of what you will find when you visit the map, we have decided to sit down with profiled artists, designers and organization to shed light on the work being done at the intersection of art and social justice in Baltimore neighborhoods. 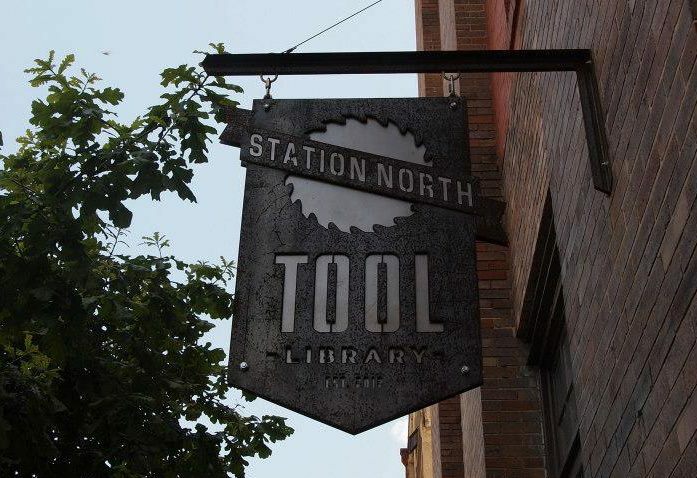 We recently chatted with members of the Station North Tool Library to talk about the great assets they are bringing to Baltimore area artists, craftsman, hobbyist and homeowners. Check out the interview below and get on the map so we can put you in the spotlight! BA+ JP: So, tell us who you are and what you do? BA+JP: Which neighborhood do you live in and which neighborhood do you work in? BA+JP: Describe your art or organization? Piper Watson: Station North Tool Library is a non-profit tool lending library – it works just like a book library but you can check out tools! BA+JP: What are you currently working on? Piper Watson: Opening a Public Workshop space in the back of the library that people can utilize and take classes in. BA+JP: What social justice cause(s) are you particularly drawn to, and why? Piper Watson: Preserving socioeconomic diversity in neighborhoods like Greenmount West by providing affordable access to tools, skills and work-space that allows people to maintain/develop a sense of pride in their environment; be it the condition of their home, their block, or their community. Bringing the City back to life from the vacant housing issue starts with the people still living in those neighborhoods – providing some kind of resource like the tool library to inspire those folks to take pride in where they live once again, will inspire other like-minded individuals to want to be their neighbors and create a community. Baltimore is made up of tons of individual neighborhoods that have uniquely rich histories worth revitalizing! BA+JP: Who or what inspires you? BA+JP: What’s the best part about being an artist or running an arts organization in Baltimore? Piper Watson: Baltimore is an incredibly supportive city! The dog-eat-dog attitude simply does not exist here. There is room for everyone to do what they would like to do and everyone is appreciative of that kind of unique vision. We are continuously overwhelmed by the amazing folks that want to collaborate and support us! BA+JP: What’s the worst part about being an artist or running an arts organization in Baltimore? Piper Watson: Uh…… *crickets* can’t think of anything. BA+JP: What sort of and/or social justice projects would you love to take on? BA+JP: Who would you like to collaborate on a project with? Piper Watson: Anyone that sees the value in people learning to work with their hands and do things for themselves! BA+JP: What’s one social justice organization that people need to know about, and why? BA+JP: What type of ways do you see artists addressing social justice issues in Baltimore? Piper Watson: Artists have the unique ability to translate powerful statements into “conversation starters” via their medium. Without starting the conversation, change cannot even begin to take place. Often times art provides a bit of a cushion for people to begin to address very challenging topics. BA+JP: How do you think artists or arts organizations are changing Baltimore? Piper Watson: You can see the visible changes with mural projects like Open Walls or The Wall Hunters or community greening efforts like Oliver Playspace or Charles North Garden, but that’s really just an outward expression of the creative vibrancy that has existed here for decades. I think that human beings are naturally much happier in environments that are colorful and activated rather than decayed and that happiness is contagious, making its way into various aspects of people’s lives; how they care about others, their home, their community. Artists are also able to implement their ideas more organically than say a developer just plopping something down onto a neighborhood and expecting people to care about it. I like using street artists as an example of this because often times when they are creating a larger mural it’s day after day of working in a neighborhood – gradually they meet the people living there and learn their stories; which often times make their way into the piece being created so it’s actually a collaboration of sorts, an homage. People take pride in things like that and being a part of that, and pride is exactly what this city needs to flourish.